This is the most eminently practical knitter's helper on the market. Portable and versatile, this attractive boxed set of five lightweight stitch guides, each devoted to a different type of stitch, is perfect for knitters on the go. 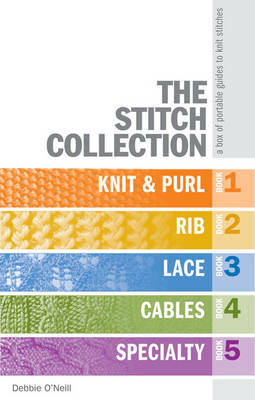 Altogether, these small but very thorough books cover more than 200 stitches, with individual manuals for knit and purl; cables; lace; ribbing and specialty. Each one features a brief introduction; a concise section on choosing the appropriate stitch pattern; information on each type of stitch; abbreviations; needle size chart; and yarn weight chart. Unlike heavier and more unwieldy books, these sleek volumes are just right for tossing in the knitting bag which makes them the most eminently practical knitter's helper on the market.